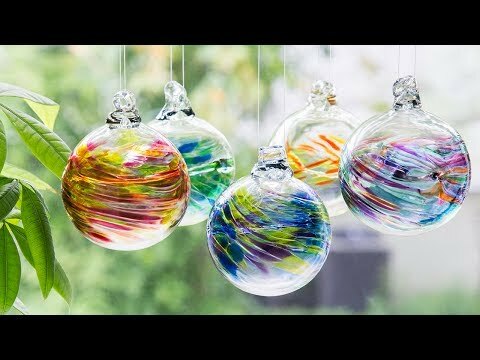 For over two decades the Kitras have been making these beautiful hand blown glass ornaments in their Canadian studio. They’re inspired by the shades of traditional gemstones, so you can match the color to a loved one’s birthday month. Whether you place them on a counter or hang them up, when the sunlight hits these delicate orbs they give off a lovely, colorful light. I check Grommet regularly and kept coming back to this. I gave 2, 1 for each granddaughter for Easter. Absolutely stunning work! Love it! Always fun shopping at Grommet! 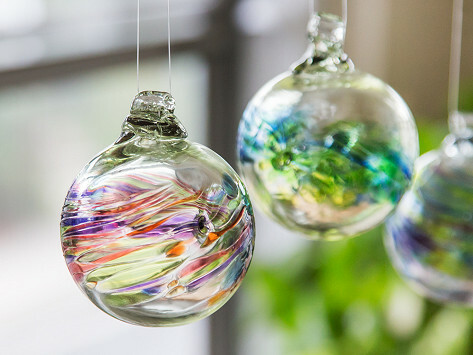 Love the handmade Art Glass balls ,offered by The Grommet..
One is lovely and three hung together is exquisite.. I bought two of these as gifts: April and July. They are brilliantly colored and truly beautiful when catching light.